Thousands of state legislative races. With key political contests gearing up nationwide, here’s a look at the races where gun owners can make the difference. It’s a major election year. Add to it the election of the leader of the free world, and it seems pretty easy to understand why this election, even more than most, is critically important. But in the context of protecting the Second Amendment, it becomes crystal clear why Election 2008 is one of the most important in our history. The news coverage of the presidential race is widespread. Over the past eight years, President George W. Bush has done many things in support of the Second Amendment. He signed the Protection of Lawful Commerce in Arms Act to protect the firearm industry from reckless lawsuits. With appointments from John Ashcroft at the Justice Department, to John Bolton at the State Department and the United Nations, his tenure has been a success for our Right to Keep and Bear Arms. Now that his tumultuous term is coming to an end, we face a contest to replace him that (at press time) features Hillary Clinton and Barack Obama--two of the most anti-gun senators in U.S. history. That choice alone makes this election important; it becomes even more so in considering the rest of the political landscape. In the coming months, NRA-ILA will provide you with vital information on the races at all levels, culminating with the Political Preference Charts in the November issues of all of NRA’s official magazines. But as we enter the summer of this election year, when many states are still preparing to hold their primary elections to determine their party nominees, we should take a look at what’s coming and the choices that must be made. Eleven states have gubernatorial races: Delaware, Indiana, Missouri, Montana, New Hampshire, North Carolina, North Dakota, Vermont, Utah, Washington and West Virginia. Six have pro-gun incumbents running for re-election, three have open seats with no incumbent, and two have anti-gun incumbents seeking second terms. The six pro-gun incumbents--Indiana’s Mitch Daniels, R; Montana’s Brian Schweitzer, D; North Dakota’s John Hoeven, R; Utah’s Jon Huntsman, R; Vermont’s Jim Douglas, R; and West Virginia’s Joe Manchin, D--have all earned the support of gun owners for re-election. Gun owners should work to re-elect these Second Amendment advocates. The race in Indiana is of particular interest because Governor Daniels faces strong opposition from anti-gun candidates, and the race is viewed as very close. In open seat races, gun owners have to replace two retiring pro-gun governors in Missouri and North Carolina. North Carolina’s primaries for these offices have just been completed, but Missouri won’t decide until August 5. That gives gun owners the opportunity to find and support pro-gun candidates in these races. Gun owners in Missouri face the task of replacing pro-gun Governor Matt Blunt. The likely Democratic nominee, Jay Nixon, is no friend of gun owners based on his previous opposition to Missouri’s Right-to-Carry law. At this time, there are a number of pro-Second Amendment candidates running in the gop primary, but in the current political environment the winner faces a difficult race in the fall. Gun owners will need to step up their efforts in Missouri to help ensure a pro-gun governor is elected in November. Looking beyond the governors’ races, there are 35 U.S. Senate races, including special elections in Mississippi and Wyoming. Of those races, only 10 are thought to be competitive. The bad news for gun owners, however, is that a majority of those close races involve pro-gun incumbents or open seats that have been held by friends of gun owners. That means we will have to work overtime this election year to protect our narrow, bipartisan pro-gun majority in the U.S. Senate. Many of these competitive races involve either pro-gun incumbents (Alaska’s Ted Stevens, R; New Hampshire’s John Sununu, R; North Carolina’s Elizabeth Dole, R; and Minnesota’s Norm Coleman, R) or open seats of retiring pro-gun senators (in New Mexico and Colorado). With very tight divisions in the Senate, these five toss-up races may well determine if there is a pro-gun Senate majority for the 111th Congress. As is the case every two years, all 435 House seats are up for election in 2008. Just as in the Senate, however, only a relative handful are actually considered competitive, but those races will certainly determine if the U.S. House of Representatives will become a center of anti-gun activity. Experts believe about 75 to 80 House races are competitive, with only 40 or so truly up for grabs. The challenge for gun owners is that 28 of those 40 seats are currently held by strong pro-gun legislators and, of those, 17 are open seat races, which are always tight contests. The prospect that the 2008 election will send anti-gun politicians to fill these seats creates a serious threat to Second Amendment rights. The balance of power could shift to the anti-gun leadership in the House, giving Speaker Nancy Pelosi and Judiciary Chairman John Conyers a free hand to press forward with the anti-gun legislation for which many of their extreme supporters are clamoring. Some of the key races that we believe will be close in November include open seat races in Alabama, Arizona, Florida, Illinois, Michigan, Minnesota, New Mexico, New York and Ohio. And several pro-gun incumbents face stiff challenges: Don Young, R-Alaska; Marilyn Musgrave, R-Colo.; Zach Space, D-Ohio; Tim Walberg, R-Mich.; Jon Porter, R-Nev.; Brad Ellsworth, D-Ind. ; Robin Hayes, R-N.C.; Sam Graves, R-Mo. ; Tom Feeney, R-Fla.; Tim Walz, D-Minn.; Randy Kuhl, R-N.Y.; and Steve Chabot, R-Ohio. It is important to remember that politics change like the weather. These are volatile times, and pro-gun candidates once thought safe can quickly become threatened or targeted by our opposition. Likewise, pro-gun challengers to anti-gun incumbents can gain ground when events give them the opportunity--and when gun owners take action to show their support. The time is now for NRA members, gun owners and all who want to protect our Second Amendment rights to get involved in the 2008 election. Waiting until September or October to become informed about the candidates, to volunteer or to contribute is no longer an option. 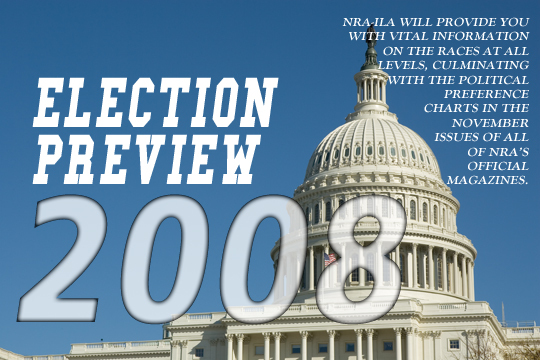 The future of gun owners’ rights in America is at stake, and your work and dedication can make the difference on Election Day 2008.